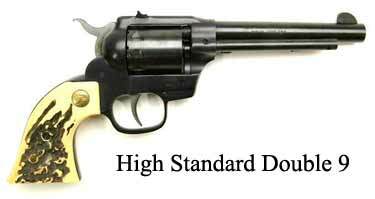 Somewhere around 14 years of age — 50 years ago — I acquired a 22 revolver, a High Standard Double Nine. If I remember right, I bought it at a Western Auto store and the price had to have been less than $50 or I wouldn’t have been able to afford it. Even though there were some differences between it and a sho ’nuff cowboy gun, i.e. double-action instead of single action and swing-out cylinder rather than a loading gate, it was close enough for me to be satisfied. And nine shots without reloading lead to some serious plinkin’. For you city folks, plinkin’ is shooting at tin cans or bottles or other items found in a junk pile, just for fun. I think the name comes from the sound of a bullet hitting a tin can, which is always a favorite plinkn’ target. It’s a fascinating pastime, even more fun than shooting at bullseye targets. Tin cans tumble. Bottles chatter. Jugs full of water go “thunk.” Cans shot at as they pass under a bridge sink. I know, many of us don’t live where we can do that kind of shooting anymore, but we can always hope for someone to invite us to the farm every now and then. When I had my double-nine it was always with me, at least in my truck. But somewhere along the way, I traded it off for something. I think it was a stereo. Dumb move. I’ve missed that pistol for years. Trying to buy one like it now is not easy. You can find listings for Double Nines at some of the online auctions, but the good ones are gone before I even discover them. The ones that remain always leave something to be desired. It’s not that I have a lot of plinkin’ opportunities. I get to the shooting range fairly often, but roaming the countryside looking for plinkin’ targets just isn’t something I’m readily able to do. Still, I can dream. That dreaming, plus a number of upcoming NRA Basic Pistol classes to teach, lead me to acquire a modern-day counterpart to the old Double 9. My new gun is a Ruger’s Single 10. It’s the classic Single Six, but with a 10-round cylinder instead of 6. It’s a very pretty gun, reflective of Ruger’s quality workmanship. That the Single 10 is a single-action makes absolutely no difference to me. The best I remember I always cocked the High Standard before pulling the trigger. I’m a much better shot that way. A couple of added features really make the Single 10 a better gun. Walnut gunfighter grips fit the hand easily and the Hi-Viz target sights really suit my 64 year-old eyes. One of the joys of using this revolver to introduce new shooters to the art of pistolcraft is that it’s very accurate. If we properly teach them sight alignment and sight picture plus how to stand, grip, breath and pull the trigger, they will be rewarded with holes in the target where they want them. And they’ll have the added benefit of experiencing a finely-crafted firearm for their initial shooting experience. I don’t know that I’ll ever throw this gun in the truck and haul it around the country, but you can bet I’ll be on the lookout for plinkin’ opportunities!